So I'm a planner. Well, I'm a project manager by trade, and that kind of by default makes me a professional planner. I'm all about scheduling and organizing things in advance. I like spontaneous things too, but I always feel more comfortable if everything is planned out. My husband? Not so much. He'd rather figure it out along the way. Sigh. Anyway, so I'm a big planner, but I'm not sure I'm far enough ahead to start planning Christmas! Of course now is probably the time - if I want to make any gifts I better start crackin'! Looks like the blog world is try to tell me something, because I found these first two projects this week! The other one is an older one (that I posted in Christmas in July) but I love so much I wanted to include again. Let me know how you are doing on your Christmas planning!! 2. The Daily Digi recently posted on a fully digital planner, including full download. So if you are less of a paper cutter and more of a photoshopper (I just coined a new term!) then this one is for you! 3. 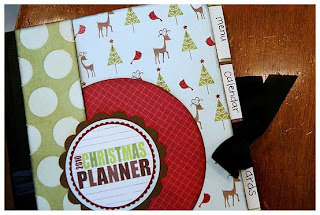 And here is Stacy's holiday planner, which seems to be the most affordable of them all. She used a little spiral notebook! Doesn't make it any less adorable or organizational worthy! Which is your favorite? Do you use a different planner format? Or none at all? I know you'll be jealous about this! I actually ordered one of the cheap small notebooks last year from one of the photo companies (sorry, can't remember which one!). I put fun pictures of our family throughout the cover and labeled it Christmas 2010. Then I bought some labels to divide my notebook (nothing fancy, though). I've been using it to plan. Not a lot in it yet, but I just pulled it out again and put it in my purse to start making more notes as I'm out and about. I loved the idea & thanks for showing me yet another way to feed my obsession about lists :).